UFC 1 is still an entertaining show to watch nearly two decades after the mixed martial arts competition debuted on pay-per-view. Instead of focusing on who was the best fighter, UFC 1 was about determining which style of fighting was the greatest. None of the fights made it past the five-minute mark, and that’s a good thing, since the finalists would endure three fights in one night. That's a full year’s schedule for some of today’s fighters. In an alternate bout that didn't air, Jason Delucia beat Trent Jenkins with a rear naked choke. 1. Gerard Gordeau (savate) destroyed Telia Tuli (sumo). Like a good sumo, Tuli rushed at Gordeau and pushed him to the outside of the Octagon. However, Gordeau pushed him back. Tuli landed in a seated position, and Gordeau blasted him with a kick to the face. Give credit to Tuli; once the cobwebs cleared, he wanted to keep fighting. After a period of confusion that lasted longer than the fight itself, the ref ruled that Gordeau had won by knockout. 2. Kevin Rosier (kickboxing) beat Zane Frazier (karate) by TKO. These two weren’t even thinking about grappling. They were just blasting each other with bare-knuckle shots. Late in the first round, both men ran out of gas, but Rosier gathered himself for a flurry of punches and stomps, and Frazier’s cornerman threw in the towel. 3. 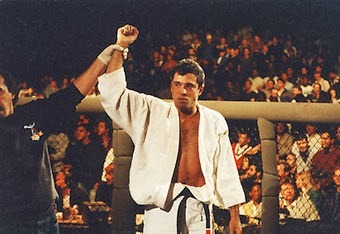 Royce Gracie (Brazilian jiu jitsu) beat Art Jimmerson (boxing) by submission.